This method extracts the response out of the sd passed in. Method called when the response is ready. Method called when a fault is generated by the remote server. Method called when there was an error. Definition at line 60 of file llsdrpcclient.h. Definition at line 54 of file llsdrpcclient.cpp. Definition at line 62 of file llsdrpcclient.cpp. Any appropriate data found in the sd passed in will be extracted and managed by this object - not copied or cloned. It will still be up to the caller to delete the pointer passed in. sd The raw structured data response from the remote server. Returns true if this was able to parse the structured data. Definition at line 67 of file llsdrpcclient.cpp. 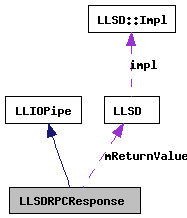 References LLSD::clear(), LLSDRPC_FAULT_NAME(), LLSDRPC_RESPONSE_NAME(), mIsError, mIsFault, mReturnValue, LLMemType::MTYPE_IO_SD_CLIENT, and tut::sd(). Definition at line 91 of file llsdrpcclient.cpp. References error(), fault(), mIsError, mIsFault, LLMemType::MTYPE_IO_SD_CLIENT, PUMP_DEBUG, response(), and LLIOPipe::STATUS_DONE. Definition at line 110 of file llsdrpcclient.h. Referenced by extractResponse(), and process_impl(). Definition at line 111 of file llsdrpcclient.h. Definition at line 109 of file llsdrpcclient.h. 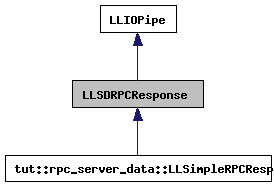 Referenced by extractResponse(), tut::rpc_server_data::LLSimpleRPCResponse::fault(), and tut::rpc_server_data::LLSimpleRPCResponse::response().